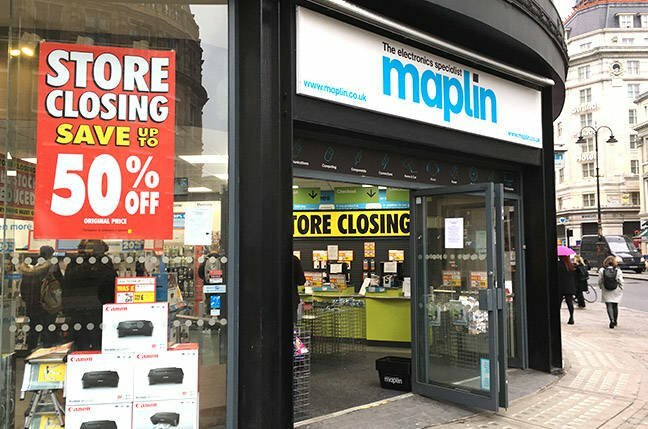 Closing-down sale posters are being plastered over the shop windows of moribund Brit 'leccy tat emporium Maplin Electronics, but even now the discounted goods can still be bought more cheaply from rivals. The Maplin administration team at PwC, appointed on 28 February, has so far failed to strike a deal to sell the retailer’s assets and late last week began laying off staff – 63 of them at HQ. The “lack of interest” from a third party in taking on some or all of the stores could lead to a “controlled closure programme”, PwC warned days ago and it seems that process has started. Thanks to Reg reader David for snapping the Glasgow store entering the death spiral, and thanks also to our own Joe Fay for his camera work at Maplin's London Strand branch. Thanks to Reg reader David for this snap of the Glasgow sale. The sales promotion has seen product prices slashed in-store by between 10 to 50 per cent, but even factoring this into the equation, seven out of eight products El Reg compared can be procured more cheaply on the Interweb. Take the Western Digital 8TB My Cloud Home for example: it is being flogged by Maplin at £278.20 compared to £309 before the closing down sale began, but it is also available brand new from eBay for £254.99. The Yale Smart Living Alarm kit was reduced to £314.99 from £349.99, but it is on sale on Amazon for £260.97. The Philips Hue wireless lighting GU10 white and colour starter kit was cut by Maplin to £152.99 from £169.99 but is available from Scan at £148.99. Netgear’s Orb WiFi was on the discount shelf at Maplin for £296.99 versus the earlier price of £329.99. Reseller Insight has the device on sale in its digi store for £254.39. One of the most embarrassing comparisons was Maplin trying to offload the Powerbeats 3 blue wireless headphones for £135.96, down from £169.93. This product was actually found on Currys for £122. No doubt there were some bargains on offer from Maplin, but even in its dying moments the retailer remains reassuringly expensive. PwC has not yet indicated any timeframe for shuttering the 200 Maplin outlets across the UK, or if any will indeed be rescued by a buyer, and it has not returned our calls for comment at the time of publication. As Reg readers will have known for many months, Maplin’s fate was sealed when credit insurers began to reduce their exposure to the business, a trend that began in October and continued in December.